Anytime of day is Blueberry Time! A versatile ingredient for breakfasts, lunches, dinners, desserts & lunchboxes! OZblu brings you our variety of bigger, bolder blueberries year-round by working with Mother Nature, adding a little bit of science and a whole lot of passion. You won't find bigger, firmer or juicier blueberries anywhere else. 36% of your daily vitamin K, 25% of your vitamin C & manganese and 17% of your daily fibre requirements... Nature’s little superfood that packs a big punch! Through our unique breeding program we have created a range of blueberries that are juicier, crunchier and tastier than the older traditional varieties which are still prevalent in the market. OZblu’s range of bigger, bolder blueberries. 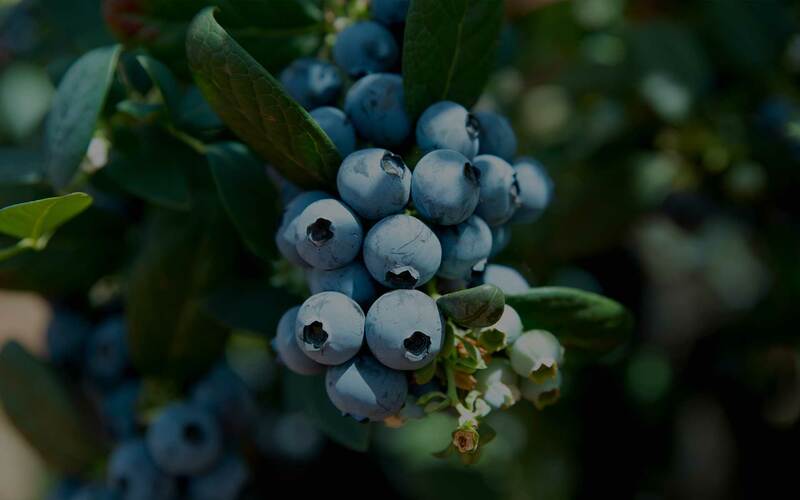 We are 100% vertically integrated – that we are responsible for every stage of the blueberries’ production – from breeding, to planting, to growing, to harvesting, to packing, to transporting and distribution. Superior genetics and matching one of our unique blueberry varieties to the different growing region ensures year-round availability so that now, every season is blueberry season! The three pillars of sustainability are the foundation upon which we build our business. We believe that economic performance is inseparable from social and environmental performance. Our food safety program is founded on the principles of Good Agriculture Practices (GAPs) and Hazard Analysis and Critical Control Point (HACCP). It is reinforced through annual third party audits. WHY ARE OUR BLUEBERRIES UNIQUE? All the OZblu blueberry varieties meet our strict criteria for size (bigger range), taste (sweeter), firmness (crispier), colour (deep blue), natural bloom, a longer shelf life and juiciness – simply put a far superior quality of berry and eating experience! Ask for OZblu’s… because not all blueberries are created equal. Blueberries are making headlines for all the right reasons. Blueberries are one of the most nutrient-dense foods in the world and contain large levels and a broad range of antioxidants. As a nutritionist, I love recommending blueberries to my clients. And I regularly eat them as well. Blueberries are healthy, low in calories, versatile, and taste great. These little powerhouses provide tasty ways of staying healthy. Blueberries may be small, but the fruit offers huge health benefits, from boosting brain health to battling UTIs.